Processing facilities understand the importance of maintaining a clean process environment to ensure product quality and purity. That’s where a good Clean-in-place (CIP) System comes in to play. without having to remove or disassemble piping or equipment to accommodate cleaning. CIP Systems pump cleaning, rinsing, and sanitizing solutions through the same piping path as the product to eliminate product soil from all internal surfaces. CIP cycles are typically run either after a processing run that has produced normal soiling or when changing over a processing line from one product to another. Minimizes Mistakes: Automating cleaning reduces the chance of human error that can contribute to an unsafe product. Keeps Employees Safe: Reduces chemical exposure by containing cleaning solutions within the system. 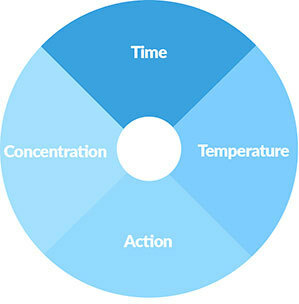 More Production Time: As less production time is lost to cleaning, more time is spent making product. Product Quality: Reliable and repeatable cleaning means sustainable product quality and consistency. Less contamination means fewer product recalls and higher brand confidence. Utility Savings: Water and energy usage is reduced through repeatable cycle control. What kinds of product am I cleaning out of the equipment? What kinds of equipment am I cleaning? How often do I need to clean to maintain product quality? 1. What Kind of Product Am I Cleaning? You wouldn’t wash your clothes with the same chemicals you use to clean your dishes. And you wouldn’t wash your dog with the same chemicals you’d use to clean your car. The same holds true when selecting a CIP system. Different types of food and chemical soils present different types of cleaning challenges. Identifying the kind of product soil you’re cleaning helps you identify what you need from your CIP system. Product soil in this category is the easiest to clean and requires a less complex cleaning system. This type of soil is easily soluble and doesn’t adhere tightly to the walls of tanks and piping. In many cases, a majority of the soil can be removed with a thorough pre-rinse. The remaining soil is easily dissolved with a caustic wash. Lower temperatures and fewer chemicals are required since the nature of the product soil allows the action of the fluid to dislodge and carry away most of the soil and a single caustic wash cycle finishes the job. A single or 2-tank system may suffice in most cases. Less soluble products require stronger detergent concentrations and higher temperatures to adequately remove the soil. Fats and proteins, particularly when exposed to high heat, must be broken down in order to be flushed from the system. Dairy products can also leave behind a tough scale that will require an acid wash. Dense, dried or insoluble material can be the most demanding to clean. For these products, it may be cost-effective to clear a majority of the residual product in the lines by using a projectile product recovery system prior to cleaning. The savings in time, water, chemical, and energy costs could easily offset the cost of the projectile system in just weeks or months. Pre-rinsing dense material typically removes less soil, so it may be possible to re-use the same pre-rinse on multiple washes. Multiple high temperature caustic and acid washes may be required. 2. What Equipment Am I Cleaning? The size and design of your CIP system are heavily influenced by the piping and equipment you are cleaning. A CIP system is designed to clean piping and equipment that is specifically CIP-able. Processors should ensure their process circuits and equipment are designed to be cleaned in place. A CIP system can only work well when used with a CIP-able process system of piping, valves, and tanks. Proper cleaning of your piping, tubing, and in-line fittings is a primary focus for any clean-in-place system. The strategy for satisfactorily cleaning them is fairly straightforward. The key is the second letter of the TACT acronym: Action. Regardless of the time, temperature and chemical concentration of your cleaning fluid, the flow velocity must be high enough to create turbulent flow or “action.” This mechanical action is primarily responsible for dislodging residual product from the interior surface of the process lines and fittings. The correct supply flow rate creates enough turbulence throughout the complete circuit, to give you the cleaning results you need. The larger the line size, the more flow required to achieve required velocity. Pipe size is, therefore, a factor in pump selection. Variables such as internal surface finish, piping elevations and the number and type of fittings all play a part in the final calculation and equipment specification. To be cleaned in place, all parts of the processing system must be drainable. Piping should be sloped properly to allow for drainage. Ideally ¼ inch per foot. Tank bottoms must be designed correctly to be fully draining. Eccentric reducers are used appropriately to reduce liquid holdup in process lines. Proper draining helps avoid bacterial growth and potential corrosion of the piping. The inside surface finish of the piping can greatly impact cleaning cycle requirements. The smoother the surface finish, the more easily the soiling will release from the surface. EHEDG and 3A both require a surface roughness average of no greater than 32Ra µin (0.8Ra µm). All interconnecting piping should also have cleanable joints that are sanitary and CIP-able with elastomers that are compatible with the CIP chemicals and the product. Any piping or fittings that cannot be cleaned adequately by CIP such as dead legs or instrument connections must be removed from the circuit and cleaned by other means. TrueClean® clean-in-place capable (CIP'able) air blow check valve. 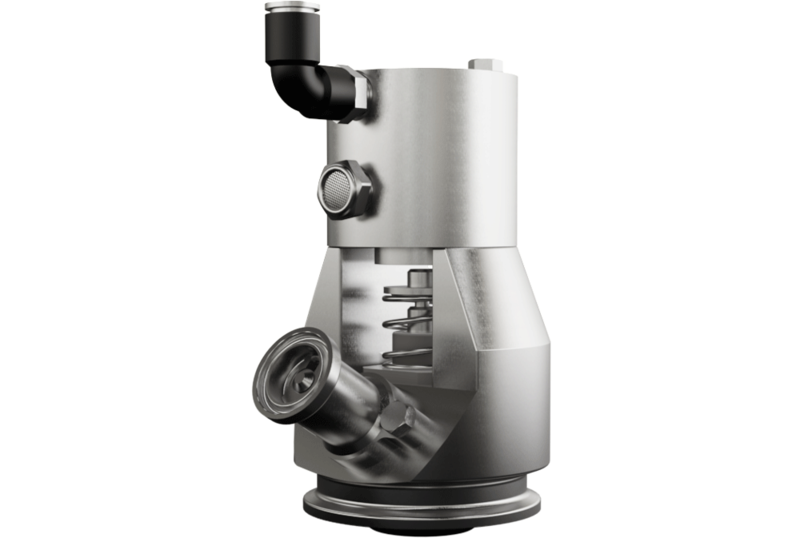 Much like the process lines, they are mounted in, cleaning process valves in place is primarily dependent on turbulent flow rushing through the valve to dislodge residual product. All internal areas of a valve that have been exposed to product must be exposed to the cleaning solution; therefore, all valves must be specifically designed for CIP. Valves that are not explicitly designed for CIP lack design features that allow flow through the valve to adequately clean all internal surfaces. Any valve that is not specifically designed for CIP must be removed from the circuit and cleaned by other means. In most cases, they could be replaced during the CIP cycle by a simple spool piece. Valves must also be cycled through their full stroke length during cleaning to ensure proper cleaning. This step can be labor intensive for manual valves but is easily programmable for automated systems. Tanks and vessels present their own unique challenges. Proper selection and placement of the spray devices used to wash the interior surface of the tank is a complicated process and should only be done by an experienced tank cleaning expert. Some spray device manufacturers have developed computer programs that can run a virtual cleaning cycle on your tank using a number of different spray devices. These programs can be a big advantage in determining the best device for the job and optimal positioning as well. The interior surface of the tank should be a smooth, cleanable surface. Any internal components that are not essential to the manufacturing process should be removed, if possible, to avoid blind spots or “shadows” that might be blocked from exposure to the cleaning solution. For best results, all corners should have a radius and all weld seams should be located on flat areas, not in the corners. Take additional care to ensure that all port locations and recesses inside the tank are sufficiently exposed to the cleaning solution, which can be difficult to reach and may receive inadequate cleaning as a result. All spray devices should be located and oriented so that the cleaning solution is directed precisely at the intended location with sufficient flow and pressure. Without adequate volume or force, the cleaning solution is unable to do its job. For example, spray devices are commonly installed to direct their spray upward to the top of the tank so the solution can clean the sides as it cascades downward. Frequently there is far too little volume supplied to the spray device and as a result, the top of the tank is well cleaned but the rest of the tank is poorly cleaned. The remedy for this common mistake is to increase pump capacity to provide enough flow and pressure to the device. Your process system may also contain other equipment that may not be easily CIP-able. And determine whether they can be cleaned in place adequately. Some equipment may require installing a custom piping component or removing some elements of the circuit completely in order to facilitate cleaning in place. Due to the complex knowledge required to properly analyze your system’s piping, valves, and tanks for CIP System installation, it’s important to partner with a company that knows CIP design and is an expert in process systems to ensure all areas of your process system are correctly cleaned. 3. How Often Do I Need to Clean-in-place? The frequency must be sufficient to ensure product safety and quality, bearing in mind that cleaning cycles that are run more frequently than necessary can waste valuable time and resources. That’s why it is important to consider the nature of the product when determining frequency of CIP cycles. Some products are not prone to bacterial growth and may not require a CIP cycle following every production run. 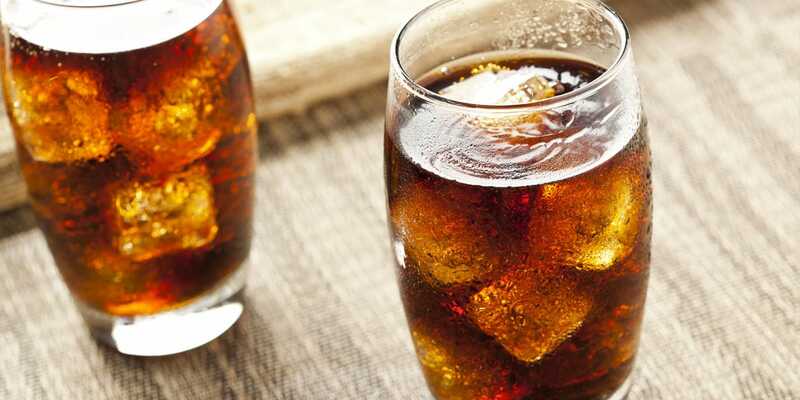 Products such as carbonated soda and vinegar are acidic and do not represent a high risk for bacterial growth, so less frequent CIP cycles may be possible. Dairy products, on the other hand, can quickly grow harmful bacteria and must be cleaned regularly and thoroughly. Products that are exposed to high temperatures during processing can pose additional cleaning concerns. Dried or burnt-on soils can be difficult to remove, so cleaning cycles should be frequent enough to minimize build-up. Periodically the cleaning system itself needs to be cleaned. It is important to include this aspect in the CIP design if you plan on installing dedicated piping and spray devices in the CIP tanks. Alternately, facility standard operating procedures should be put in place for operators to manually clean and inspect the CIP system. If the CIP system utilizes spray devices, the control system can be setup with a self-cleaning recipe. Auto cleaning removes build-up of cleaning products and residue in the piping and tanks, enabling the CIP system to operate at maximum efficiency. 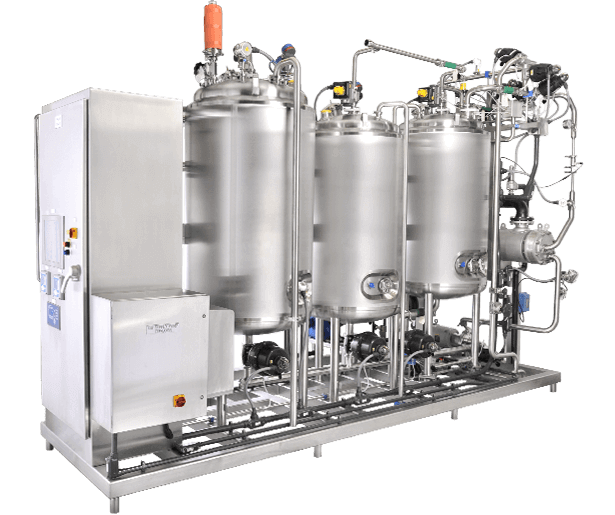 Purchasing and installing a CIP system for your processing facility is a considerable undertaking, requiring analysis, planning and above all, partners. Create a team of knowledgeable operators. Create a team of managers from multiple departments. Connect with a trusted company that has vast experience in designing and building process and CIP systems. CSI has the ability to engineer, design, and fabricate a custom Clean-in-place System to meet your exact hygienic processing needs. CIP equipment from CSI helps you control, monitor, and document the cleaning methods that are essential to sanitary processing. With CSI's state-of-the-art, climate-controlled fabrication shop, the quality of equipment leaving our facility is second to none. We offer in-house, Level II inspection in accordance with the latest ASNT recommended Practice No. SNT-TC-1A, so you can be certain your equipment meets industry standards. To speak with a CIP expert request a quote below or call 800.654.5635. 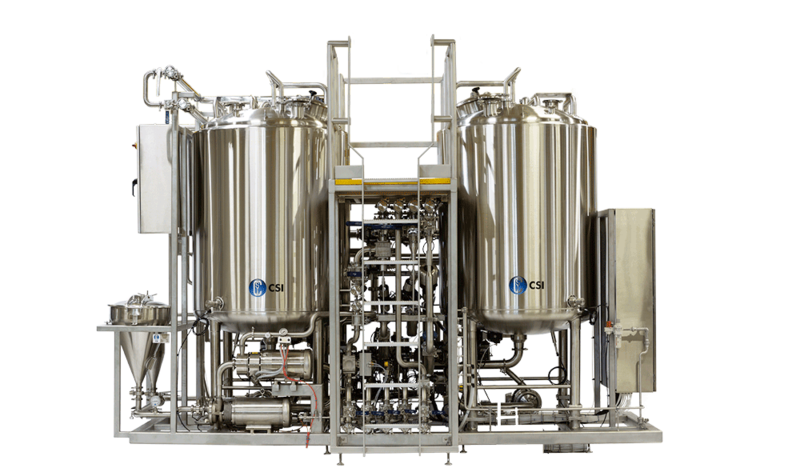 Central States Industrial Equipment (CSI) is a leader in detail design and execution for hygienic process systems in the food, dairy, beverage, pharmaceutical, biotechnology, and personal care industries. 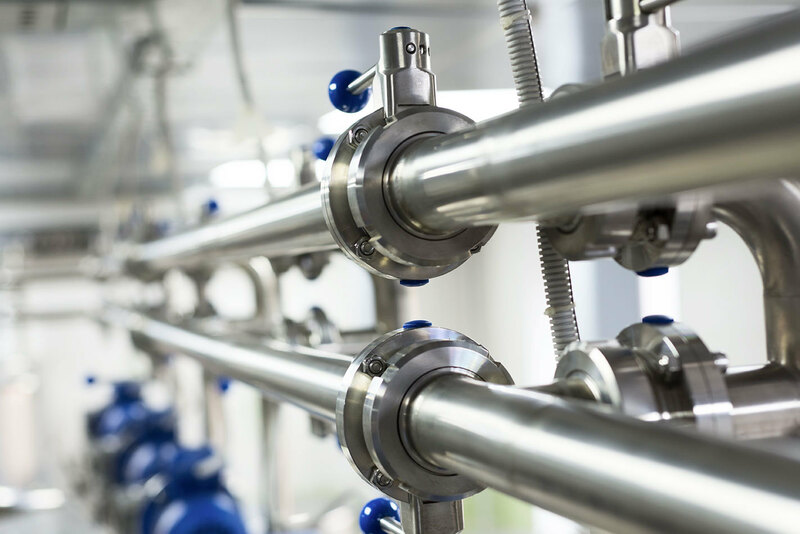 Specializing in process piping, system start-ups, equipment testing, and cleaning systems, CSI leverages technology, intellectual property, and industry expertise to deliver solutions to processing problems. CSI also distributes a wide range of sanitary processing equipment along with installation materials including fittings, pumps, valves, tubing, and instrumentation. We also stock complete lines of corrosion-resistant Super Alloys AL-6XN® and Hastelloy® C-22. Customers ranging from processors, OEM's, mechanical and electrical contractors to engineering firms and resellers in the processing industry turn to Central States Industrial Equipment for its breadth of experience, depth of expertise, and innovation.